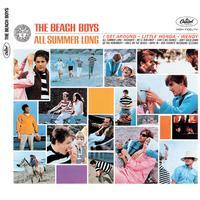 The best pre-1965 Beach Boys album featured their brilliant number one single "I Get Around," as well as other standout cuts in the beautifully sad "Wendy," "Little Honda" (one of their best hot rod tunes, covered by the Hondells for a hit), and their remake of the late-'50s doo wop classic "Hushabye." The nostalgic "All Summer Long," another great production, seemed (whether intentionally or not) like a sort of farewell to the frivolous California beach culture that had supplied the lyrical grist for most of their music up to this point, with a longing, regretful chorus that was totally at odds with the bouncy arrangement. Other relatively little-known treasures are the sumptuous ballad "Girls on the Beach," with some of their best early harmonizing, and "Don't Back Down," with uncommonly anxious lyrics. You can't give an unqualified high rating, however, to an album that also contained such disposable filler as the "Our Favorite Recording Sessions" comedy bit and "Do You Remember?," a "let's-pay-tribute-to-rock's-early-days" number with a sh*t-eating grin wide enough to qualify as an oldies radio ID jingle. [Little Deuce Coupe/All Summer Long, a Capitol two-fer CD, combines this and Little Deuce Coupe onto one disc, adding the 45 version of "Be True to Your School," alternate takes of "Little Honda" and "Don't Back Down," and the previously unreleased "All Dressed Up for School. Both Stereo and Mono!